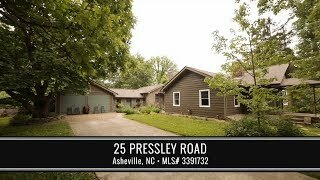 "Unique", "special", and "rare" are words to describe this stunning oasis just 7 min from downtown Asheville! One level living in a thoughtfully updated ranch with newer heating & cooling, remodeled baths, hardwood floors, & three (yes three!) fireplaces! Master suite w/lovely view of the extensive grounds, private full bath w/tile shower, fireplace w/built-ins. Attached artist's studio w/woodstove could make nice VRBO if finished! Extensive gardens, orchards, & berries with permaculture features (see attachments!). Cute outbuilding w/sleeping porch. Additional lot potential w/ appraisal at $79,000 (buyer to confirm w/City). Directions: I-240 to 70 East, Left into Haw Creek, Right at stop sign, Left on Trinity Chapel, Left on Old Haw Creek, Immediate right on Pressley to # 25 on right.